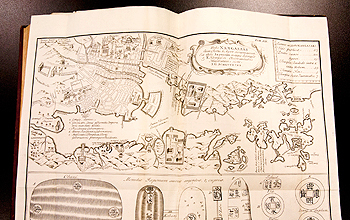 In 1690, the German physician Engelbert Kæmpfer was stationed at the Dutch trading post on Dejima. This was at a time when Holland was the only Western country with which Japan had established diplomatic relations. After two years, Kæmpfer returned to Europe with a miscellany of Japanese manuscripts and other items collected during his stay. When he died in 1716, Kæmpfer’s nephew sold materials from the collection, as well as Kæmpfer’s own notes, to the founder of the British Museum, Sir Hans Sloane. Sir Sloane had Kæmpfer’s writings translated and compiled, eventually forming the two-volume oeuvre, The History of Japan, completed in 1727. Because this is a widely known fact, it will not be further discussed here. 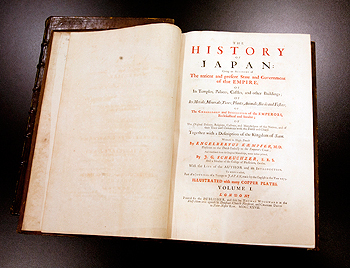 Kæmpfer’s History of Japan, published in 1728, is the second oldest work owned by the Lisa Sainsbury Library. As you can see in the image below, it has a bookplate with the inscription “Nil Sine Numine / Thomas Weld. ESQ / Lulworth Castle”. “Nil Sine Numine” is Latin and translates as “nothing without the Deity”. Lulworth Castle is the name of a castle in Dorset, England. To this day the castle is still owned by the Weld family. Although the edifice is called a ‘castle’, it was not constructed as a fortification; it was originally built in the early seventeenth century by Thomas Howard to serve as a hunting lodge. On 2 January 1642 the Catholic Englishman Humphrey Weld (1611–1685) bought the land, including the castle, from the Howards for £30,000. Humphrey died in 1685 and, because he had no son of his own, Lulworth Castle was bequeathed to his nephew William (1649–1698). After William, sons of the succeeding generations inherited Lulworth. 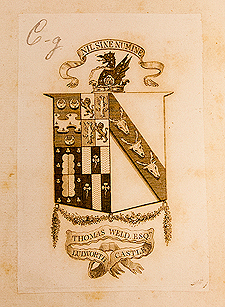 Following the death of William’s great-grandson Edward in 1775, the castle finally came into the possession of his younger brother, Thomas Weld (1750–1810)—the man whose name is written on the bookplate. When Thomas Weld unexpectedly inherited Lulworth Castle in 1775 he was 25 years old. Thomas was the second son in the family and lived with his wife Mary in Britwell, Oxfordshire. After inheriting Lulworth he left Britwell to move into the castle with his family in July 1776. His older brother Edward passed away in the midst of refurbishments of the castle’s interior. It is therefore thought that the castle was probably something of a construction site when Thomas moved in with his family. Thomas wanted to change the interior to his own taste in the then popular “Adam-style”. However, instead of entrusting the refurbishment to the Adam brothers themselves, he asked John Tasker, a Catholic architect, to take on the project and the major redecoration of Lulworth Castle’s interior was finally completed in 1782. Following the alterations, a new library was created adjacent to the drawing room on the first floor. This library has been appraised as “perhaps the most attractive [room of the house], with its book-lined walls and carved stone fireplace set beneath the deep embrasure of a window”. 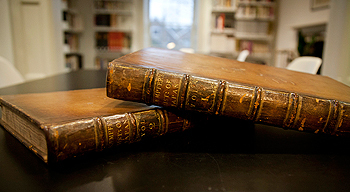 Moreover, The New Weymouth Guide, published in 1798, mentions that the library is “said to contain two thousand volumes of the best and most approved authors”. We can suppose that two of these two thousand books were volumes one and two of Kæmpfer’s History of Japan. Although Thomas Weld passed away in 1810 at the age of sixty, the Adam style interior he introduced to Lulworth Castle, the impressive library and its collection of books remained intact into the twentieth century. However, on 29 August 1929 Lulworth Castle was ravaged by a disastrous fire. The castle burned for three days and, though an attempt was made to rescue as many of its valuable contents as possible, the fire reduced the interior and a great deal of the family heirlooms to ashes; only the outer walls were spared. It is unclear whether the copy of Kæmpfer’s History of Japan owned by the Lisa Sainsbury Library was one of the items that survived the fire or whether it had already left the Weld family, but it is interesting to note that there is no bookplate in this copy other than that of Thomas Weld. Sir Hugh and Lady Cortazzi, who donated this book to the Lisa Sainsbury Library, relate that it was bought in 1960 at Maggs (an antiquarian bookshop that specialises in rare books), Berkeley Square, London. By going through Magg’s Sales Catalogues of the 1960s with a fine-tooth comb, one could perhaps discover whether or not this book was put on sale by the Weld family at the time. This, however, remains a topic for further research. Berkeley, J. Lulworth and the Welds. Gillingham: Blackmore, 1971. Lulworth Castle. The Weld family & Lulworth. Wareham: Lulworth Castle, 2004? Somerset Publishers, The Encyclopedia of Colorado. St. Clair Shores, MI: Somerset Publishers, 1999.